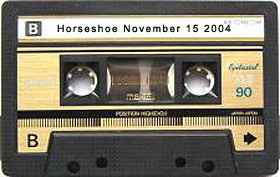 Details: The Rheostatics, live at the Legendary Horseshoe Tavern in Toronto, November 15, 2004. This was the 7th show of their 12 night Fall Nationals run at the Horseshoe. Two versions are available - Mark Sloggett's soundboard recording and 8 track files provided by Steve Clarkson - mixed by Darrin Cappe with a bit of track specific compression, gain, limiting and slight reverb to drum and vocal tracks. Very beginning of Onilley's Strange Dream was missing from the Clarkson files so I have substituted that section of the Sloggett files in its place. Track listing below is the Sloggett Version - sound samples from both can be found below.